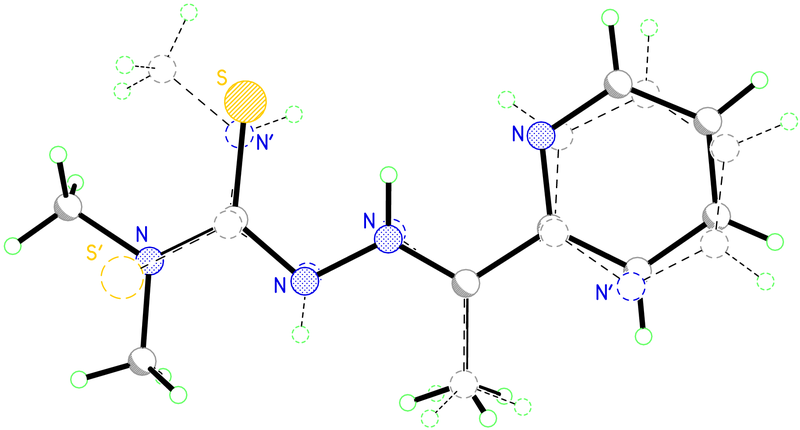 Four 2-acetylpyridine 4N-alkyl thiosemicarbazones, and their Ga(III) and In(III) complexes have been prepared and characterised by fluorescence, UV–Vis, IR, 1H and 13C NMR spectroscopy, mass spectrometry and X-ray crystallographic analysis. Comparison of the crystal structures gave an insight into the nature of the complexes formed, demonstrating a preference for [ML2]+ type complexes with gallium and [MLX3] species with indium. Stability studies on two candidates indicated that complex [InL3Cl2MeOH] was stable to chemical degradation for prolonged periods in human serum, giving this complex potential for further biological evaluation. Overlay of two thiosemicarbazone ligands showing two different conformations.